Barbie Fashionistas CHAMBRAY CHIC Curvy Doll New! IN STOCK NOW! 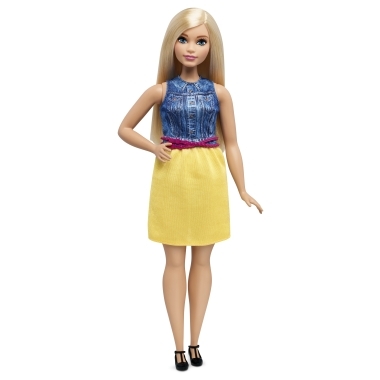 Barbie Fashionistas doll wears an adorable dress with yellow skirt and a chambray denim top with a collar and pocket detailing. Cute black flats are casual cool, and her bright pink belt adds a pop of color. Long blonde hair styled straight completes her fabulous look.